Golden Syrup is the new experimental pop act from songwriter and sound artist Sara Retallick. You might recognise her sweet-toned pipes from Melbourne band Jimmy Tait, whose 2013 AMP-nominated record Golden was a favourite here at WTH. On debut track ‘Didn’t Go Home’, Retallick takes a sharp turn from her former indie rock project. Woven out of samples, field recordings and tape manipulations, the new material is spare, sinister and oddly ritualistic. Droning bass notes and a work-gang rhythm underpin Retallick’s incantatory vocals, while shards of noise and disembodied laughter unsettle the track’s placid surface. ‘I went to your birthday party/and I didn’t go home again,’ she sings, darkly. Seldom has a song about hooking up sounded quite so creepy. 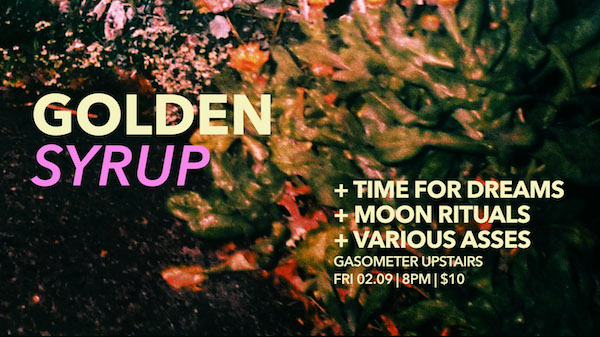 Golden Syrup’s single launch party is this Friday at the Gasometer. Moon Rituals, Time for Dreams and Superstar side project Various Asses will be supporting, plus Laura Jean will pop in for a DJ set. RSVP on Facebook. Apologies to any Sarah Blasko fans out there, but acoustic guitar-slinging songstresses have never really been my thing. You know, the ones who write weepy ballads about their ‘man’ or, possibly worse, peppy empowerment jigs about moving on. The same thing goes for the boys, I guess. Hopefully one day John Butler’s dreadlocks will strangle (or at least gag) him. For some reason, these lightweight, folksy ballads irk me more when they come from women. That probably makes me sound like some sort of iron-trousered, neo-Thatcherite anti-feminist, but hear me out. In an industry that’s still mostly male-dominated, when a woman gets herself out there I just don’t want to see her ‘femininity’ come off so darn cliched. What I do want to see are post-punk hellraisers like Savages, fall-down drunks resurrected like Cat Power, psychedelic mums like Beaches‘ Alison Bolger, digression-prone eccentrics like The Orbweavers‘ Marita Dyson. Or jaded cynics like Jimmy Tait front woman, Sara Retallick. ‘All my friends/Sitting on the fence/They’ll never rush to my defence,’ Retallick sighs on new single, ‘All My Friends’. She sounds a bit mournful, but mostly just resigned. She’s been referred to as ‘Australian gothic’, but the result is less gauche than that might lead you to believe. The new song creeps up on you, accruing some satisfying little touches as it goes along – like the bend in the main guitar riff and the low voice that shadows Retallick’s lead. With the swaying choral ensemble of the last few bars, it’s probably the most melodically beautiful thing Jimmy Tait has produced so far. Retallick has been performing as Jimmy Tait since 2008. The band’s current incarnation features members of the Gin Club, The Orphanage and The Wintership. People like to point to the influence of slowcore on Retallick’s songwriting, and there are intimations here of Low’s Things We Lost in the Fire, but her music also calls to mind the deep drawl and simple riffs of Smog. That alt-country link rings true to some extent – Jimmy Tait was named after Retallick’s drover grandfather James Tait, and the upcoming album was recorded in her home town of Katunga, a blip on the map of North-East Victoria. The record is due out some time in September. If it lives up to the promise of ‘All My Friends’, Australia’s got a new singer/songwriter worth getting behind.